To view drug prices, pharmacy location searches, set up a mail order account, visit Optum Rx website. Note: You will need to call 1-855-312-6103 to be set up within Optum Rx first. Once you are registered you can set up an online account through the Optum Rx website. There are Rx that require Pre-Authorization before able to fill. If you have a prescription on one of the two PA lists below please contact your doctor. Your doctor will need to provide information to ScripWorld. Contact information is found on your insurance card. If your prescription is found on the Quantity Limits PA list below, you only have to obtain Prior Authorization if your doctor prescribes over the quantity limit listed. Out-patient includes ER, Out-patient procedures, day surgery, Major Imaging services. This benefit is for PPO Participants only and only applies towards eligible medical expenses. To file a claim provide the provider your SIS Supplemental Insurance Card. If the provider will not file a secondary insurance claim on your behalf the procedures to file for reimbursement are below. Itemized statement such as HCFA 1500 or UB04 from provider – must include BOTH procedure AND diagnostic codes. If doctor or facility will not provide this form to you, have them file the secondary claim on your behalf. EOB from Meritain proving amount was applied toward deductible and/or Out of Pocket. Receipt(s) of payment if you made payments toward your medical bill. Flexible Spending allows you to elect up to a maximum specified amount to use, PRE-TAX, for unreimbursed medical, prescriptions, dental, and vision related costs. This would be the costs, you as the employee, pay for co-pays, prescription co-pays, dental work, glasses, contacts, LASIK, etc. The elected amount is taken out in equal installments via payroll pre-tax. Meaning the deduction decreases your taxable income. Dependent Day care is another benefit that allows you to elect up to a maximum specified amount to use for child care costs. Please see below for further explanation between Child Care Credit vs. Daycare Flexible Spending. Which is better for you? To check you FSA balances anytime, anywhere….download the app. City contributes up to $1,000 per year for individual and $2000 for family coverage into a Health Savings Account for participants in the High Deductible Medical Plan. Below is H.S.A. Banking information. Participants can only use H.S.A. contribution funds on certain qualified expenses. Please see the list below for Qualified Expenses. For further information on your account and to log in please see HSA Participant Guide. For further information and account set up, visit H.S.A. 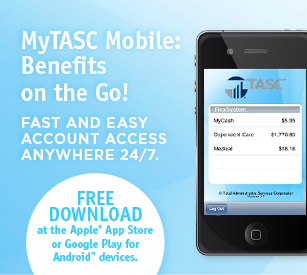 – TASC website. To access your claim information and print cards visit myCigna. To register you will need either your social or use the above plan number. For smart phone app savvy users – download the MyCigna app to view your dental information. Unfortunately the dental and vision accounts are not linked in one location. Vision is a separate site.